It’s no secret that both international travel and searching for a new job both require any variety of personal, professional and academic documents from passports to transcripts, so it only makes sense that taking a job teaching English abroad means having certain important papers ready to go. There may be some documentation that you can only take care of once you are in your destination country, but typically you want to have your docs prepared and ready to go well in advance (in many cases you will need it for the interview process or to process a visa prior to your departure from your home country). Document requirements for getting hired as an English teacher and moving to a new country will vary from country to country and even from job to job - in many cases employers may inform you during the interview process which exact documents will be required for employment and relocation. Passport - To be granted entry into a foreign country, you must have a passport valid typically for at least six months after your entry into that country, and in some cases you may not be allowed entry into your destination country, or issued an entry visa, without holding a passport that will be valid for a full year. For extended travel and teaching English abroad, we recommend that you travel on a passport with at least two years of validity remaining. Americans can learn about applying for a new passport by visiting the U.S. State Department's Passport web page. Citizens of other nations should contact their ministry of foreign affairs to learn how and where to apply for a passport. Visas – You may or may not need to obtain a visa prior to traveling to your destination country – this will vary country-by-country and job-by-job. To learn more about visas, please read: What is a visa and do I need a visa to teach English abroad? 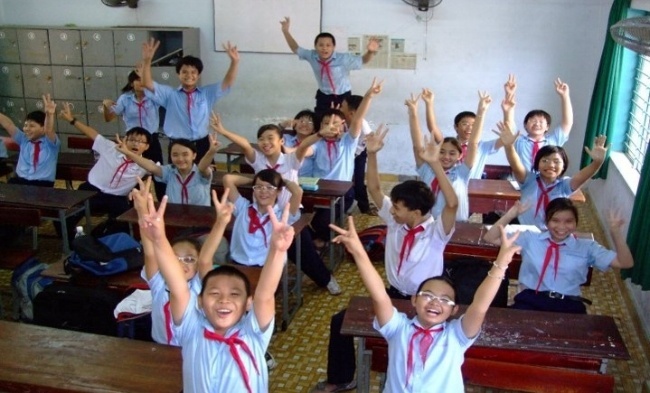 Wan to learn more about visa requirements and teaching English abroad? 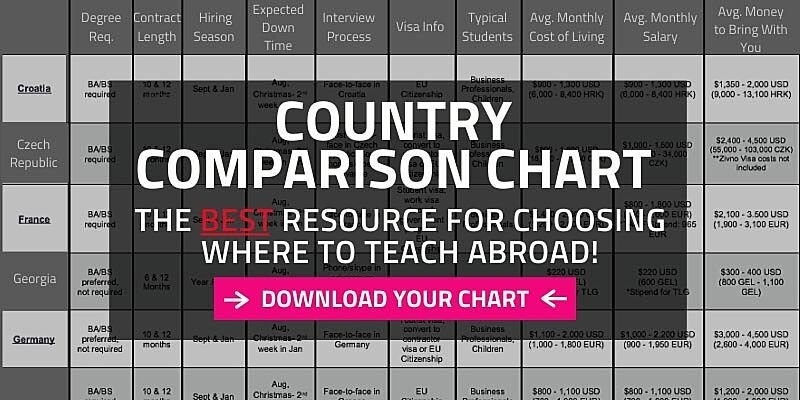 Click here to request a Country Chart that details salaries, hiring requirements, interview procedures and visa information for more than 50 countries around the world. TEFL / TESOL Certification – Some employers will insist on seeing the actual certificate; in other cases, a copy may suffice. In some cases, your certificate may need to be notarized or Apostille Authenticated (internationally notarized); this will vary from country-to-country and in some cases from school to school. Criminal Background Check - Background checks are typically required to get hired and/or receive a work visa to teach English in Asia and the Middle East. In some cases, a state check may suffice, but increasingly, the FBI Background Check is required by governments in major teaching markets such as Korea, Vietnam and many countries in the Persian Gulf such as the U.A.E. and Saudi Arabia. Individual schools in many other nations also require this check. Background checks are not routinely required to gain employment teaching English in Europe or Latin America, but individual schools or government programs in countries like France and Spain, may require them. Even though a background check may not be required, it will always be safe to have one on hand and it can provide credibility for you as somebody worthy of employment as a professional English teacher. Cover Letter - In some cases, you may need to translate your cover letter into the local language for the country where you plan to teach. International Resume - In some cases, you may need to translate your resume into the local language for the country where you plan to teach. Photos - Make sure they’re professional looking! Most jobs want 2 photos, 1 as a head shot and a 2nd as a full body shot (to see that you are dressed professionally). This is how you would look walking in their front door to shake their hand asking for a job and to teach paying customers. College Transcript and/or College Diploma - In some cases, originals are required; in others, copies will suffice. For transcripts they should be be in the sealed envelope, do not break the seal or they are not valid. Contact your college or university to obtain these. You should order two or three to have a back up, they are typically $ 6 - 8. Medical Forms - In some cases, these may be required to obtain an entry visa. Forms and requirements may vary. In Saudi Arabia, for example, and HIV-AIDS test is required. Japan is known to require a TB test and chest extra. In other countries, such as South Korea, you may be required to undergo a physical and/or a drug test upon arrival. Apostille & Notarization - In many cases your documents will need to receive an international notarization known as an apostille. Use Google or contact a local government body such as the secretary of state to learn where and how you can get your documents apostilled in your area or through an online service. Make sure you speak with your TEFL advisor about these questions before enrolling in a TEFL class. All International TEFL Academy graduates are provided with an extensive job guidance manual with this material and also full time staff in the Student Affairs department to help you when looking for your English teaching job.